Now that the dust has settled (for the most part), both Columbus and Nashville can rest easy – at least when it comes to the smoothness of said trade negotiation. In an interview today, General Manager David Poile noted that, “if Roman Josi wasn’t doing as good as he is, we wouldn’t have made this trade”. There no doubt this was a very difficult decision for GMDP; as a team possibly best known for its development of elite defensemen, it certainly wouldn’t be easy choosing which guy would be on the trade block. Of course, Shea Weber is not up for debate (despite many throwing his name out there – it’s not going to happen) and, with the Norris-caliber performance Roman Josi has been displaying recently certainly meant he wasn’t going anywhere. Yes, trading off the budding 21-year-old who has plenty of potential and time to grow that is Seth Jones (and the fact Poile loved the kid) would be a difficult move to make. However, the success of this trade – a simple him-for-him – shows the urgent need of both teams. As stated in my previous post, Columbus is in desperate need of defense; Nashville is in serious need of some offense. The trade between both teams was a no-brainer. Now, decided who to let go (who could potentially boost an opposing team and cause an issue later on down the road) is the tricky part. If you have done any digging on Mr. Johansen, or you’ve just been following current events relating to the subject, you’ve probably heard he and the Columbus organization – namely head coach John Tortorella – had some disagreements, so to say. Nothing major or involving off-ice behavior, just normal coach-to-player disconnect. Tortorella, who was hired in October, believed Johansen’s performance decline was due to being out of shape and essentially marked him as a healthy scratch a few times. It was later determined that the center had an “undisclosed illness” that was attributing to his negative performance. I’ve come across a few comments from fans regarding Johansen’s performance once the trade was announced, including “good luck. Johansen is a lazy player” to “well, Columbus clearly got the better end of the deal”. Now, I must take the comments with a grain of salt (and so should you) as these are fans with some serious bias. Nashville is no different, with fans bashing Jones’ performance as well. To see an in-depth, detailed look at Jonansen’s numbers, check out OnTheForecheck’s assessment here. But, from what I gather, Ryan Johansen and John Tortorella simply did not mesh well and, let’s be honest, it is Tortorella we are talking about. The man is a bit on the nutty side, to put it nicely. Again, I shall take those comments from Blue Jackets fans with a grain of salt and you should, too. However, we shall be the judge of Ryan Johansen’s “laziness” starting tomorrow when the Predators take on the 20-18-3 Colorado Avalanche in Denver. Of course, Johansen is not going to come flying onto the ice with a golden halo with angels tooting horns behind him; he’ll need time to get used to a new system. This kid has spent his entire professional career under the Blue Jackets organization so it’ll take a bit to see which line he pairs best with. According to Adam Vingan of The Tennessean, Peter Laviolette stated that Johansen will start with Colin Wilson and James Neal. Ryan Johansen practiced with the team today and is expected to suit up for tomorrow night’s bout in Denver. Debate as to what number Johansen would choose was floating around yesterday as his current number 19 belongs to Calle Jarnkrok. It was announced earlier this morning that Johansen would go with #92 in recognition of his birth year, 1992. The 23-year-old center is confident in his abilities and, to quote GMDP, “We accomplished something we haven’t been able to do in 18 years. We got a first line center.” That tells you right there that GMDP is confident with this trade. Of course, offering up Seth Jones, who will likely become a defensive star within a few years, was enough of an example of Poile’s confidence as any. Again, the most that you need to take away from this post is that don’t expect him to come out guns a blazing tomorrow night, though that would be awesome. However, Johansen has proven himself in more ways than one that projects a confidence that will result in great success for Nashville. As long as I didn’t just jinx it. Also, for those wondering who are too afraid to ask, Ryan Johansen is from Vancouver, Canada. Needless to say, his name is pronounced JOE-Hansen, not YO-Hansen. I’ll be the first to admit I immediately thought it was YO-Hansen, but I blame Jarnkrok, Josi, and Juuse Saros for that. I just want more Scandinavian players, okay. You’ll hear various versions of how to pronounce Johansen as he settles in with the club (even David Poile has been calling him Yo-hansen), so just note that it is JOE, not YO. Speculation has been running wild about when (not if) the Predators and Mike Fisher would come to an agreement on a new deal. And boy, did Fish get a raise! 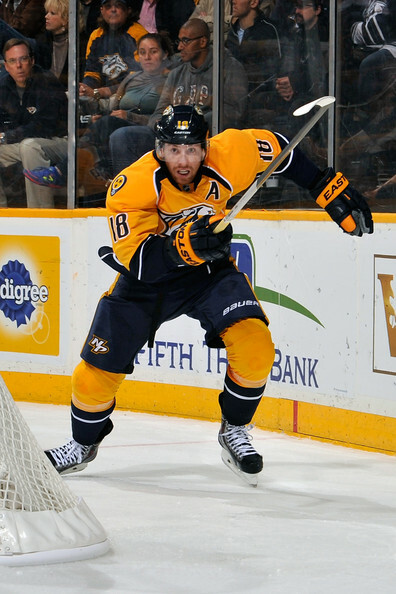 This morning, news was announced that the 35-year-old forward inked a two-year, $8.8M contract to remain in Nashville. Fisher will receive $4.8M of that deal in this upcoming 2016-15 season then the remaining $4M in the 2016-17 season. So, breathe a sigh of relief, all you Fisher fans. He’s back. David Poile: "I'm certainly hoping [Fisher] plays for more than two years. At the end of the day, I'm hoping he retires as a Predator." Game 5 is upon us, ladies and gents and from here on out, it’s do or die for the Nashville Predators if they intend on hoisting that big silver Cup in the end. I am not going to go into what the Predators need to do to win tonight (and those two other possible games); no, we know and the players, coaches, and whatnot know, too. It’s just a matter of getting the job done. Scott Darling is not invincible; he truly is all that has stood between the Predators and taking Round One. Chicago should be kissing his feet right about now because, without him, they’d be facing a quick exit out of the playoffs themselves. Yesterday afternoon, the Predators recalled nine players from Milwaukee. No need to panic, everyone; this is not regular season so there is an unlimited amount of players you can have on a roster. Some may see some ice time, but really, they are just here for emergencies and/or experience. The players chosen? Joe Piskula, Rich Clune, Marek Mazanec, Magnus Hellberg, Anthony Bitetto, Johan Alm, Colton Sissons, Austin Watson, and Viktor Arvidsson. No surprise, the Blackhawks have chosen to go with Scott Darling as their starter for tonight’s game. No need to panic – Kris Martel quickly reported that Wilson did show up to the locker room looking fine. Colin Wilson & Shea Weber are not participating in the morning skate. Mike Fisher, Eric Nystrom & Viktor Arvidsson are on the ice for #Preds a.m. skate. Shea Weber, Gabriel Bourque & Colin Wilson are not. Though Fisher was a game time decision Tuesday (and didn’t play), knowing that he’s back out there again is a good sign. Also, long time no see, Eric Nystrom! Though I am doubtful of his magical return for tonight’s game, his presence brings hope. Anaheim becomes the first team to advance to the second round, sweeping the Winnipeg Jets. However, Jets fans stood tall with the sinking ship, giving their team an affable standing ovation for a tremendous season. The Ottawa Senators live to see another day game, shutting down the Montreal Canadiens 1-0 last night. I have been on edge all day so far and I hope you have been, too. The love for hockey is crazy like that, I guess. It’s going to be deafening in the Bridgestone Arena tonight; I hope you got your tickets. To say this game is huge for either team is an insane understatement. I’d be lying if I said I stayed awake for all three overtime bouts last night. The combination of my love to sleep and the whole “work” factor sent me snoozing in the intermission between the first and second overtime. In what was now the longest game played in Preds franchise history, it is disheartening to know that they came out with the loss. Unfortunately, this is more than a loss; it gave Chicago the 3-1 lead in the series, meaning it could all come to an abrupt end tomorrow night for Nashville. Eek. This has been certainly a series about the goaltenders. Pekka Rinne, though a little rusty here and there, was carrying the team on his back last night. He kept the Predators in the game. The same can be said for Chicago’s Scott Darling. Neither Nashville or Chicago is doing exceptionally well in the offense/defense department. I mean, both are taking it to the net, but the majority of these bouts have come down to which goaltender is going to slip up first. Unfortunately for Nashville, it has been Rinne. Colin Wilson has been the playoff superstar thus far, notching his fourth goal of the playoffs last night to give Nashville a short 1-0 lead in the first period. James Neal would finally make his presence known late in the second, giving Nashville the 2-1 lead going into the third period. I think a lot of us were too busy celebrating a successful second period that we forgot there was another period to go. Welp, if the Predators play well with their backs against the wall, tomorrow should be no contest. I mean, they are practically hugging it at this point. Breaking Darling is really what Nashville needs to do now. He is trained on those long range missiles; let’s take it to the net. The issue with taking it to the net, however, is that the Predators are notorious for their terrible puck control, making it easy for Chicago to bat it [the puck] away from them, killing the focus. I’m going to keep it short today, as my brain has not recovered from the amount of caffeine I’ve just consumed and I do not want to cling to an outcome that cannot change. Come on home, boys. Rookie Kevin Fiala got his first taste of playoff hockey last night, becoming the sixth youngest player to do so in the organization. It was also – technically – his first away game, too. Pekka Rinne just about stripped naked last night in an effort to locate the puck that was lost in his pads during the first overtime. Mike Fisher participated in practice yesterday, but ended up bowing out of last night’s game. Still day-to-day with a lower-body injury, but maybe he’ll be ready for tomorrow? What’s with Chicago (and the officials) not being able to count? Why does this keep happening? Meaningless .gifs mean more fun for us… as long as they involve the Predators. The #Preds TV ratings continue to get better. Game 4 got a 3.3 locally, maintaining a 3.0 after midnight even. James Neal’s hit on Duncan Keith dislodged a panel of glass at one point. That’s cool. UPDATED – @PredsNHL are coming home at 3:00p today. Let’s welcome them back at the Signature Air 801 Hangar Lane and show our #PREDSPRIDE. How’s everyone doing during the #ICESTORM2015? What was supposed to be ideal, beautiful snow turned into hazardous, just-plain-evil ice across the entire state. In fact, it has been so bad, Tennessee officials declared a State of Emergency. Needless to say, the attendance for tonight’s game against the 29-21-8 San Jose Sharks wasn’t expected to be a sellout. However, the fear of being stranded somewhere along one of the deserted interstates tonight didn’t stop the Loyal Legion from turning out. As mentioned in the previous post, Anthony Bitetto was recalled last minute by Nashville to fill a void in the defense (Anton Volchenkov was placed on IR). However, where Bitetto made the flight to Nashville, his equipment bad did not. This left Nashville with a ton more forwards than defensemen. Just before puck drop, Viktor Stalberg was declared the healthy scratch and Anthony Bitetto was given the green light. But… the team was down to just five d-men for a few minutes, as Bitetto’s bag arrived a little after game start. Cody Franson and Mike Santorelli did not make their return tonight due to issues with their work visas. So… they don’t already have those? San Jose’s Matt Irwin (5) drew the first blood at 5:26, sending a wrister past Pekka Rinne. Shea Weber quickly tied it up at 13:42 with his signature slapshot, his 14th goal of the season. Mike Fisher (15) picked up the assist. Craig Smith took a chunk of Alex Stalock at 16:02, collecting his 17th goal of the season with a wrister. Mattias Ekholm (9) and Mike Ribeiro (36) tally the assists. Preds end the first period up 2-1 on the Sharks, though San Jose out-shoots Nashville 17 to 15. Just 52 seconds into the period, Craig Smith notched his second goal of the season (18) on the powerplay. Colin Wilson (20) and Seth Jones (15) punch the assists. Paul Gaustad wanted a piece of the pie and got his at 1:43, his second goal of the season. Gabriel Bourque (6) and Shea Weber (28) pick up the assists on Gaustad’s wrister. James Neal would finish off the second period with his 20th goal of the season at 10:31. Mike Ribeiro (37) collects the lone assist. San Jose out-shot Nashville 15 to 13. No goals in the third. San Jose out-shot Nashville in each period, this time 11 to 9. FYI Pekka Rinne is out of control right now. James Neal is the first on the roster to reach 20 goals and he now has 7-straight 20-goal seasons. Both Shea Weber and Mike Fisher are now on three-game point streaks. Pekka stopped 42 of 43 shots-on-goal tonight. Tell me he isn’t Vezina worthy. The Predators now hold a six-point lead over the entire NHL. With this win, the Predators are just seven wins away from clinching a playoff spot (and it isn’t even March yet) and are now 39-12-6. Wowza. The Preds take off for a three-game road trip to the East, starting with the New York Islanders on Thursday. After capturing the top of the league on Thursday night, the Predators would need to continue with a win in St. Paul to hang onto that title just a little bit longer. The Wild, who have been having some rather interesting issues, are hurting for a win, and what better way to knock the best team in the league for a loop? NOTEWORTHY: Update on injuries, Ryan Ellis will be re-evaluated after the All-Star break (January 24-25), which means he’s out for at least two weeks; he has also been placed on the IR with an lower-body injury. Also, Eric Nystrom’s injury has gone from undisclosed to classified as an upper-body. Mike Fisher would get the ball rolling early in the first period with his seventh goal of the season at 4:01. Colin Wilson (14), who has been on fire this season (to say the least), picked up the lone assist. Minnesota’s Charlie Coyle would tie the game at 14:14 for his fourth goal of the season. The Wild would outshoot the Predators 14 to 8, pointing out just how incredible Pekka Rinne really is. Both the Wild and the Predators would take nine shots on goal, but none could make their way past the opposing goaltenders during the second period. Nashville took four penalties during the second period alone, including one from Pekka Rinne (served by Craig Smith). Even more proof on why Pekka Rinne is the best goaltender in this league this season. Calle Jarnkrok would collect his fifth goal of the season at 3:48 after being in the right place at the right time whilst Niklas Backstrom was distracted. Olli Jokinen (3) and Shea Weber (19) tallied the assists. At 8:47, Colin Wilson would notch his 12th of the season with the unassisted game winning goal. Though Wilson sealed the game winner within the first ten minutes of the period, the game certainly wasn’t over. With just a few minutes left in the game, Matt Cooke decided cross-checking Shea Weber in the face was a good idea. It wasn’t. And, as you can see from the video, Angry Mike also made an appearance after Prosser took a cheap shot at Taylor Beck. After kicking the Wild’s keister not only physically but numerically as well, the Predators secured another day as the leaders of the league and improved their record to 28-9-4. The Predators welcome in the Vancouver Canucks on Tuesday and then Barry Trotz and the Washington Capitals on Friday night. – The first period proved goal-less, with both Calgary and Nashville taking a good amount of shots (Calgary 10, Nashville 8). – Calgary jumped on the board first with a PPG from Sean Monahan at 4:23 after Colin Wilson was charged with goaltender interference. – Craig Smith would tie it at one with his fourth goal of the season at 5:30 with assistance from Ryan Ellis (5) and Mattias Ekholm (2). – At 11:09, Nashville would gain the lead with a goal from James Neal, his sixth of the season. Mike Ribeiro (5) picked up the lone assist. – At 2:36, Jiri Hudler would tie the game in favor of Calgary for his third goal of the season. – Calgary would collect a second PPG during the game with a goal from TJ Brodie at 4:23 pushing the Flames up 3-2. – Not two minutes later at 6:37 Calgary would jump to 4-2 over Nashville with a clean goal from Johnny Gaudreau (2). – Nashville would come back within one at 10:47 with a PPG from James Neal (7) with some assistance from Matt Cullen (2) and Filip Forsberg (7). – Unfortunately, Calgary managed to keep Nashville at bay in time for regulation to run out, sealing the win in their favor 4-3 in the Saddledome. – The first period started off with a goal in favor of Vancouver, as Alexander Edler nabbed his second goal of the season on a PPG. – Nashville would capitalize on the powerplay at 1:38 into the second with a goal from Filip Forsberg (2), though it was clear that former Predator, Dan Hamhuis knocked the puck in. James Neal (1) and Matt Cullen (3) would pick up the assists. – Forsberg would sink one without the help of Hamhuis at 6:42 for his third goal of the season, with assistance from James Neal (2) and Mike Ribeiro (6). – At 18:27, Colin Wilson would collect his first goal of the season and the GWG. Filip Forsberg (8) and Mattias Ekholm (3) picked up the assists. – It is important to note that Vancouver was playing back-to-back games, but a regulation win is a regulation win. Nashville is almost done with its trip around the Western Conference, with the next stop in Winnipeg to visit the Jets on Tuesday night.